The Churches and Convents of Goa are a group of Catholic religious buildings that have been influential for spreading both the faith and their Portuguese style of art and architecture around Asia. They are located in Old Goa, which from 1565 was the capital of the Portuguese Indies. It was abandoned as such in 1760 because of a malaria outbreak. The Basilica of Bom Jesus holds the mortal remains of St. Francis Xavier, a missionary across Asia (India, Japan, China) who died in 1552. He is regarded as the patron saint of Goa. Once every decade on December 3, the body is taken down for veneration and for public viewing. Old Goa is now mainly an archaeological site annex open air museum - there are some restaurants, vendors and people living there in shacks, but it is hard to imagine that this once was a city of 200,000 inhabitants. Their religious structures have survived, a clutter of churches, chapels and convents in different European architectural styles. I'm not sure if the whole area of the former Portuguese city has been designated a WHS, or only the named churches and convents - the documentation on the Unesco website once again is incomplete. I arrived by local bus from Panaji, the current capital of Goa, about 15 minutes away. The site is pretty popular with Indian tourists - to them it must be a very exotic place, with its abundance of non-Indian monuments. But when you're familiar with Southern Europe or Latin America, the churches aren't that special. Most of them are plain, especially the interiors. Some of the churches have faded wall paintings or wooden carvings. Their style almost looks naïve. Only the Sé Cathedral and the Basilica (where St. Francis Xavier is buried) still seem to be used for religious services. The town is pleasant enough to spend half a day. I went around on foot, the roads are not too busy and the grounds are well-kept. Nowhere I had to pay an entrance fee. The Church of St. Francis and the Basilica hold the best ornaments. Besides the churches not much is left, except for the Viceroy's Arch near the coast - a crumbling gate that was erected to commemorate the capture of the city by the Portuguese. It appropriately has a statue of Vasco da Gama on top. Park your bikes in front of the shops by the entrance of Basilica de Bom Jesus, then after visiting it cross the main road to Se Cathedral and Church of St Francis de Assisi. These three churches make out the main touristic core of the site, so be prepared for the usual dose of noisy tourists, loud guides, and colonial opulence. Head towards The Chapel of St Catherine for a more tuned-down feeling, an ochre-colored small jewel nestled in its own small garden where tourist flows recede and the magic of olden days starts to work its way through. Enjoy a well-deserved hydration break with coconuts and plenty of water at the small shop just in front of the exit. A short few minutes ride through the forest will lead straight to the Church of St Cajetan. Despite its being modeled after Vatican's monumental San Pietro, the virtual absence of tourists will allow for an improved spiritual experience of the place. As you exit the church's compounds, head down right for a short glimpse of the Viceroy's Arch. Head back the same way and up the small hilly road ending in the small, but exquisite Our Lady of the Rosary. If you are lucky enough to arrive here jist before sunset, then you are in for a treat. The silent, breezy halls filled with art and history. The view of the river with its lush forrested banks slowly filling with mist and mistery. What remains of St Augustine's is not much, but the scenic tower with the sun setting through its arches does make for a sight to remember. You can easily take the road leading to Panaji, and through some scenic old villages with goan mansions and portuguese chapels, just from St. Augustine's. Allow for plenty of unwind & relax time once back to your accommodation area to make up for the energy well spent. I visited this WHS in November 2016. Although this WHS is made up of 7 different churches it is relatively easy to cover them all in half a day. 4 of them, namely the Basilica of Bom Jesus, the Se Cathedral, the adjoining Church and Convent of St Francis of Assisi and the Chapel of St Catherine (hidden behind the Se Cathedral). From the entrance to the Church and Convent of St Francis you can easily spot the whitewashed Church of St Cajetan in the distance and although we had a driver with us we decided to walk. Just next to the Church of St Cajetan it is worth viewing the Viceroy Arch which marks the Portuguese conquest of the city of Goa. The Church of Our Lady of the Rosary and the Tower and ruins of the Church of St Augustine are quite far away from here so a tuktuk or taxi is needed. The Church of Our Lady of the Rosary looks more like a fort than a church while what remains of the tower of St Augustine is just half! The Church of St Augustine was abandoned in 1835 due to the expulsion of the religious orders from Goa. In 1846 the main vault collapsed. The bell from the tower was initially taken to Fort Aguada and later in 1871 it was shifted to the Church of Our Lady of the Immaculate Conception in Panaji (which is very similar to the Church of Bom Jesus do Monte in Tenoes, Portugal). All in all, I think Old Goa is not one of India's best WHS but it certainly is very different from the other WHS India (and indeed the whole region) has to offer. The one thing that we realized was that, unless you have a guide or an experienced driver, most people did not know where all the seven constituent sites were actually located — they knew the more famous ones and we initially had some difficulty in locating all of them. Your best bet is to locate the Basilica of Bom Jesus or the Se Cathedral (these two are directly opposite each other across the road) — these two are very well known and serve as good reference points. Once you have located the Se Cathedral, you can find/locate a rough indicative map for all the major sites. This map is in the same complex as the Se Cathedral. 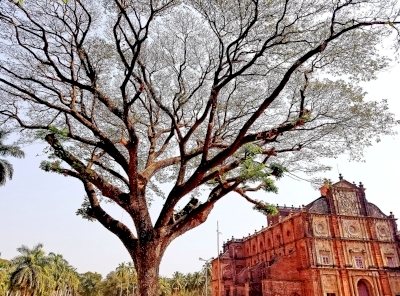 Basilica of Bom Jesus is the only monument that directly finds a mention in the UNESCO webpage. This church is famous as it contains the tomb of St. Francis Xavier and associated artifacts including the casket/coffin in which he was brought back to Goa. The Se Cathedral is located directly across the road (opposite) from the Basilica of Bom Jesus. 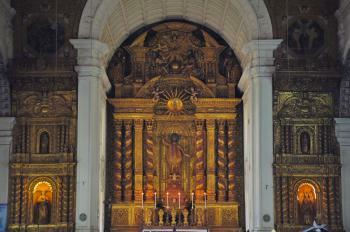 The church was more ornate than the Basilica of Bom Jesus in terms of the art work and religious motifs. Church of St. Francis of Assisi, initially completed in 1521, it was completely rebuilt in the 17th century. The church has many paintings on the life of St. Francis of Assisi and an altarpiece with a picture of Jesus and Francis Xavier. The Chapel of St Catherine was erected by the Portuguese conqueror Afonso de Albuquerque in 1510 to commemorate his triumphant entry into the city on St Catherine’s Day. Ruins of the Church of St. Augustine - founded in the late sixteenth century, the only thing noteworthy that remains of the church and monastery of St. Augustine is the tower that stands tall amidst the ruins. The 46 meter high tower served as the belfry and the facade of the church. The ruins are a sight that is not to be missed and was probably the best of what we saw among the seven monuments. Church of Divine Providence (São Caetano or Saint Cajetan) - Built by Italian friars of the Order of the Theatines in the 17th century, the facade of Church of Divine Providence is based on the design of the St. Peter’s Basilica at Rome. The church is dedicated to both Our Lady of Divine Providence and St. Catejan as is evidenced by the altars and the paintings in the church. Igreja de Nossa Senhora do Rosário/Church of Our Lady of the Rosary - built in the 16th century, Church of Our Lady of the Rosary is one of the oldest churches in Old Goa. Built at a vantage point, one can have excellent views of the Mandovi River. Since we had a flight to catch, we did manage to see all the monuments in roughly 2.5 hours. We also wanted to visit the museum in the Se Cathedral complex but we ran out of time. We definitely intend to check out the museum in our next visit to Goa. In summary, we managed to see some great monuments and the heritage churches gave us a great snapshot of the history. 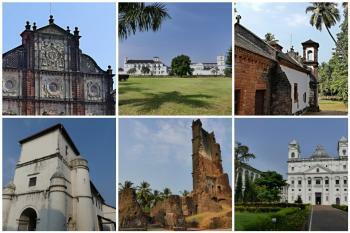 We would urge everyone visiting Goa to drop in at Old Goa and see these heritage churches. Definitely a great addition to the UNESCO World Heritage List from India’s perspective. 1. Try to locate the Basilica of Bom Jesus. It is by far the easiest church to locate in Old Goa. 2. Se Cathedral is located right opposite (across the street) from the Basilica of Bom Jesus. 3. Se Cathedral, Church of St. Francis of Assisi and the Chapel of St. Catherine are all on the same grounds/complex. 4. The museum is also in the same complex. 5. You have to locate others from the map/local guidance. 6. The airport (Dabolim) is roughly an hour away from Old Goa. 7. North Goa and South Goa would also roughly be an hour/an hour and fifteen minutes from Old Goa. Read more from Dasexps here. In February 2014 I was fortunate enough to sort a quick two day trip to Goa with my Dad (a pilot). We flew out of Manchester on Wednesday morning and were back at Gatwick by Saturday. Old Goa was founded by the Bijapur sultanate – a Shia Muslim dynasty that ruled a swathe of India from coast to coast in the southern central region. However, it is for its Portuguese prominence that the town is remembered, as it was made the colony’s most important city upon its capture from the sultanate in 1510. The first building we visited was the 408 year old Basilica of Bom Jesus (Basilica of Holy Jesus) – a large baroque structure built from granite and basalt. Uniquely in Old Goa, it is unplastered – which sets it apart from all of the other churches, which are white. It was originally plastered, but was stripped of it by “a zealous Portuguese conservationist” in 1950. We also look round the Church of St Francis of Assisi, Sé Cathedral, the Church of St Catejan, the Our Lady of the Rosary church, the Arch of the Viceroys and the ruins of the Church of St Augustine. All are within walking distance. The latter is the most striking, with an enormous fragment of a tower still standing in what is otherwise an abandoned ruin. 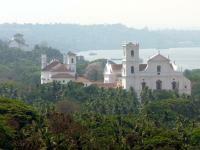 Although Goa is famous from its beaches, my main target in this state was visitig its churches and convents. The inscribed churches are groupped on a small area in Goa Velha (Old Goa), small place near Panaji, Goa's capital. It is very easy to get there by bus from Panaji bus station, and the ticket is about 10 rupees. All churches, except Bom Jesus basillica, are painted white and present themselves wonderfully in Indian sun. The ones I liked most were Se Cathedral, Church of St. Francis, Church of St. Cayetan and Bom Jesus. The latter is the place were Francisco Xavier is buried. His coffin is importan pilgrimage place for Indian (and other) catholics. The whole place may be visited in 2-3 hours, but is definitely worth seeing. On the plane from Mumbai to Goa, I sat with an Indian man who asked me which beach I planned to go, when I answered that I came here to see Old Goa churches especially the one that hold the relic of Saint Francis Xavier, he misunderstood my World Heritage Site traveling and started to praise my religious devotion! At Goa I chose to stay in the old town of Panaji or local called Panjim, the town was delightful with lovely Portuguese colonial buildings and churches. I also had great times admiring old Goa-Portuguese teak craved chairs; after first saw this kind of craving art at Pena Palace of Sintra in 2006; it became one of my favorite. Next morning I hired a taxi to take me to see Old Goa and nearby tourist attractions like spice garden and waterfalls. St. Augustine church and its convent were the first places I visited in Old Goa, the complex was once the biggest church in Goa, but now in ruinous state after Portuguese expelled the order. I walked around the complex and saw some nice ceramic tiles decoration and interesting partially collapsed high tower. After that I walked to see Convent of St. Monica, the convent interior was closing for restoration, but the big buttress and Portuguese State Seal wall motif were the highlights of its exterior. Our Lady of the Rosary Church was my next destination. The church was built on the hill behind St. Monica Convent so it was a short walk. The church’s façade was very interesting with fortress liked design. The interior was plain but I really like its pastel colored wooden altar and cute figurines. Also the warm light inside this church was the best for photography. My taxi took me to the next place, the Basilica of Bom Jesus. The Basilica is very unique with its laterite exterior contrast of other white plaster covered churches in the town. Inside I saw golden main altar, the motif was clearly the celebration of Jesuit Order. On the right side of altar was the golden tomb of St. Francis Xavier. The Basilica was full with local tourists and I had to queue in order to have a chance for closer look on the tomb and I only had ten seconds to admire it! I gave up the horde of people and decided to move on to other church in the opposite side of the road, the large complex of Se Cathedral and Church of St. Francis of Assisi. When I entered into the Church of St. Francis of Assisi, my mouth opened with wow, the interior of this church in my opinion was the most breathtaking sight in Old Goa. Actually the reason I came to Old Goa was to see this church but I mistook it with the Basilica of Bom Jesus, and that why when I entered the Basilica I was quite confused. The interior was very rich in details from beautiful wooden gilded altars, naïvely sculptures to colorful paintings and tiles decoration. Then I went to Se Cathedral, unfortunately the exterior was under restoration so I could not see the whole façade, the interior was quite similar with the Basilica of Bom Jesus, but the quality of arts were more superior in my idea. There were also many interesting painting of using Hinduism symbol in the cathedral painting around many altars. After cathedral I walked to Church of St. Cajetan passed the Viceroy’s Arch. 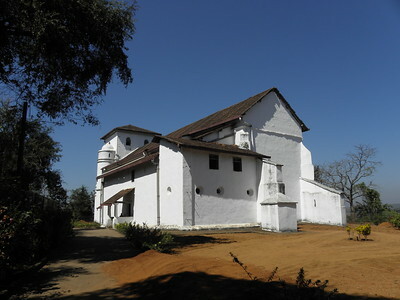 The Church of St. Cajetan was modeled after St. Peter in Vatican, so its design was quite unique for Goa. Inside the church was again with beautiful altars and inspiring white classic decoration motifs. Then my taxi took me to Church of Our Lady of the Mount, not part of World Heritage Site, but also a very nice white church on the hill. From the church I could see the whole of Old Goa with dense green jungle and dreamy white churches, the same view in Paul Tanner’s review. I also had a chance to see Bollywood film crew as they used the church as love scene filming location while I was there. I finished Old Goa tour within 3 hours longer than my taxi driver expected, he said that most of tourists will spend only 1-2 hours to see churches. In my opinion, Old Goa is a really nice place to visit, also because of its Christianity theme makes it very unique for Indian World Heritage Site, and its Portuguese architecture makes Old Goa like a different country, a nice antidote after many Mughal, Hindu, Buddhist and British Colonial arts during the long Indian trip. By the way I am quite confused with comments of Els and Paul Tanner that they were not sure which part of old Goa have been inscribed as the map in the UNESCO website is very clear that the protected areas are circled by the green lines. Apart from sites that Els already listed above, there is also a relatively unknown Gate of St. Paul College which is a part of World Heritage Site. In Goa Velha we occasionally had to pinch ourselves to remember that we were in tropical India rather than Latin America – but there were large numbers of Indians in church and wearing saris to prove it! As Els indicates in her review, it is not entirely clear what parts of Goa Velha have been inscribed. Our guide insisted that it was only the Se Cathedral, the Basilica of Bom Jesus and the Church of St Francis – but he is certainly incorrect. Some large maps displayed on locations around the site show buildings with a red dot = “World Heritage Monument” and a white one = “Other Heritage sites”. This seems to show that the Chapel of St Catherine (reconstructed in 1952 on the remains of the very first church from 1510), the Church of St Cajetan, The Church of Our Lady of the Rosary and the ruins of the Church of St Augustine are also inscribed – making 7 buildings in all. The map on the UNESCO Web site shows a much larger conservation zone covering all the central site plus a few other churches and some old city walls but whether this whole zone was inscribed isn’t clear. The 2003 “Periodic Reporting” summary report boldly states - “Status of Site Boundaries • The demarcation line and buffer zone are adequate.”!!! But all is not well in paradise! Something which surprised me was the very high profile taken by the Archaeological Survey of India (ASI) at the site which includes active churches. An enormous sign spelling out the full name of the organization occupies a central location in front of the cathedral/St Francis churches – UNESCO logos are much less in evidence!! And ASI is obviously proud of what it has achieved in terms of conservation. An exhibition in St Francis church shows a whole series of “before” and “after” photos which seem to show that the ASI has been doing a good job! But the 2003 reporting notes “A Court case is pending before the District Court filed by the Archaeological Survey of India with respect to the ownership of the churches and convents, which have been declared as Centrally Protected Monuments of National Importance through the Gazette notification. As per the notification the churches and convents are declared as Centrally Protected Monuments of National importance and Archaeological Survey of India is the sole custodian. However, the ownership of these monuments were changed in favour of church authorities by Department of Survey and Land Records without honouring the notification and the same is being challenged by the Archaeological Survey of India by filing a writ petition in the District court” The dispute rumbles on and boiled over again in Feb 2011 a month before our visit . In the light of such issues it is perhaps worth pointing out that ICOMOS recommended “deferral” for Goa until management issues had been sorted out! I visited Goa while in college in India along with friends during the Christmas-New year week in 1983. The Churches and Convents of Goa gave the feeling of being in Europe right in India! The Basilica of Bom Jesus was noteworthy and I was fortunate to visit that when Saint Francis Xavier's preserved body was exposed to the public! Although I'm a German national of Indian origin and have travelled widely all over Europe, nowhere have I seen windows like we have in Goa. They're unique. They're terrific. They're superb. And they're historic! Can't UNESCO do something to save them from extinction? We visited goa earlier earlier this year and were most impressed with the Perreira-Braganza/Menezes-Braganza house, in the village of Chandor. Apart from the colonial mansion the fact that the original furnishings still exist is amazing. Is this mansion outside the scope of World Heritage? If not it is certainly worth considering, at the moment they seem to rely on viitors donations, and as a consequence any retoration work is painfully slow. One very worrying aspect seems to be the total lack of security. I am sure some of the artifacts are very valuable indeed. I would be grateful for your comments. Sir Richard Francis Burton: Where he was invalided in 1851. His visit is recorded in "Goa and the Blue Mountains or 6 months of sick leave"
Da Cunha Family: Nuno da Cunha, son of Tristan, was Governor of the Portuguese "Estado da ?ndia" from 1529-38 and transferred its capital from Cochi to Goa in 1538 where it remained througout the Imperial period. Alfonso de Albuquerque : Captured it twice from the Sultan of Bijapur. First in March 1510 but had to withdraw after 3 months. Recaptured it with Indian allies later in the year -massacred every Muslim man, woman and child. The "Church of Our Lady of the Rosary" was said to have been built in thanks for his victory! 113 Community Members have visited.